This would not be one of those years where you go out in late February and try to find an early Laughing Gull. Extremely doubtful in fact, especially with the inch of fresh snow that fell on the cape yesterday. I busied myself identifying moths from this past summer, looking out the window at the snow fallen cedar and imagined what the real spring will be like. There have been signs of spring over the past month- Herring Gulls have lost their salt and peppery heads for snow white ones, Black Scoters numbers just started building at the point yesterday morning, and visible migration of Red-winged Blackbirds and Tree Swallows arriving the point this past weekend. As unlikely as it is to have an early Laughing Gull this year, the warm spell we recently experienced was compelling enough for one to follow the ferry over from Delaware. As far as we can tell, this is the earliest Laughing Gull to return to New Jersey. Congratulations goes to Bill Boyle who found the bird- the LAGU Award recipient this year! Upon arriving at Douglass Park, I saw the bird wheeling around with a flock of Ring-billed Gulls. I hit window button on my car to take a photo and they all came flying towards the opening window. Sorry guys, I don't have any french fries... At least it afforded some close looks at the finer details of a Laughing Gull..
A Laughing Gull's bill strongly resembles the color of blood, something that's literally accurate, at least when it comes to being a predator to endangered and threatened beach nesting birds like Piping Plovers, Least Terns, and Black Skimmers. Some of the finer points of this still beautiful bird- the red orbital ring, a black ring around the very end of the bill, and on this bird, one last feather to molt out behind the eye. All the locals have a pretty accurate color palette when imagining the back feathers of a Laughing Gull, tens of thousands of pairs breed in the marshes here during the summer so we get used to seeing them every time we step out the door. I'd almost call it a type of egg shell-carbon, the kind you see on cars. at the feeders and defends his own little slice from the flock of House Finches. A romp-around the marinas yesterday morning on the barrier islands, you wouldn't think, "yes, Laughing Gull today," with this kind of scene in front of you! It was a weekend of little treats, no major prizes to be scored but some early-season tempters to keep us interested until the main event finally springs upon us. The Dovekie at the meadows proved to be all too brief and was not present on Saturday morning, but birders trawling the area turned up a nice selection of birds; one or two Northern Gannets were welcome after an absence of these majestic birds in the bay lately, while our itinerant male Snowy Owl put in a prolonged appearance, perching atop one of the dune crossover fences at the state park and remaining perfectly still for admiring camera lenses. Luckily for him, our local Fish Crows won't return to the point for a few more weeks yet, but a couple of wandering American Crows did give chase briefly and made for some interesting birding. A Horned Lark passed west along the dune, a Tundra Swan remained on the Plover Ponds and a trickle of Tree Swallows appeared, with birds reported from South Cape May Beach, Miami Beach, Villas, Whitesboro and High's Beach. On Sunday, two Black-headed Gulls were at Miami Beach, Villas with one reported from the ferry terminal on Monday. At both locations there has been a marked increase in the number of Bonaparte's Gulls and Forster's Terns over the last couple of days too. The Painted Bunting continued to put in appearances at the Northwood Center feeders today and two Purple Finches were the first there since last fall. Out on the barrier islands, the duck show is a real spectacle in the inlets right now; Greater Scaup, Long-tailed Ducks and both Surf and Black Scoters are present in good numbers and all readily viewable. It's also been an above-average winter for White-winged Scoter - at least 12 were easy to pick out among the scoter pack at Avalon yesterday - and good numbers of Horned and Red-necked Grebes continue to be reported. There may be a few little troughs to come in the weather yet, but over all we are heading in the right direction now and warmer weather will be heading our way, and bringing good birds. This weekend saw Mourning Cloak reported, as well as some unidentified anglewings (either Eastern Comma or Questionmarks) - all butterflies that overwinter as adults and don't need too much change in temperature to tempt them out for a fly around. Amphibians are on the move too - Chorus Frogs, Spring Peepers and Cricket Frogs have all been reported calling at breeding ponds this weekend. March will soon be upon us and CMBO walks are stepping up and ready to meet incoming migrants. Check out our online calendar and come and join us for a walk, a chat, and some great birding! As mixed blackbird/grackle flocks maraud their way through our area, keep an eye out for something a little different. Rusty Blackbirds are declining rapidly throughout much of their range and give great cause for concern. Birders are encouraged to take part in the Rusty Blackbird Spring Migration Blitz and help science to understand what is happening. It is only then that we may be able to start looking at ways to reverse this worrying trend. 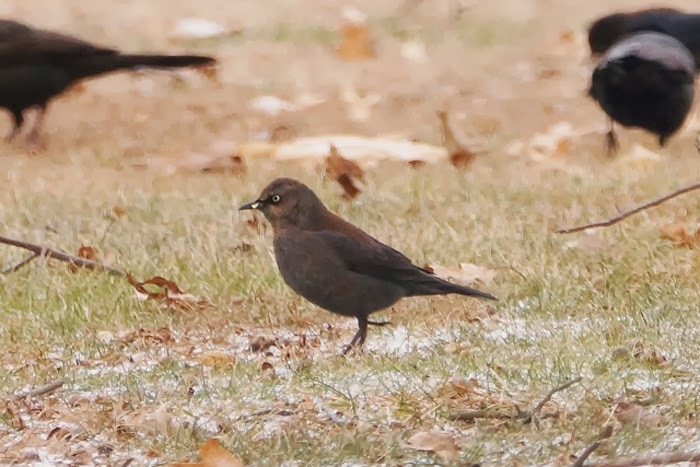 Visit the International Rusty Blackbird Working Group website and pledge to help with this important work [photo by Jeff White]. 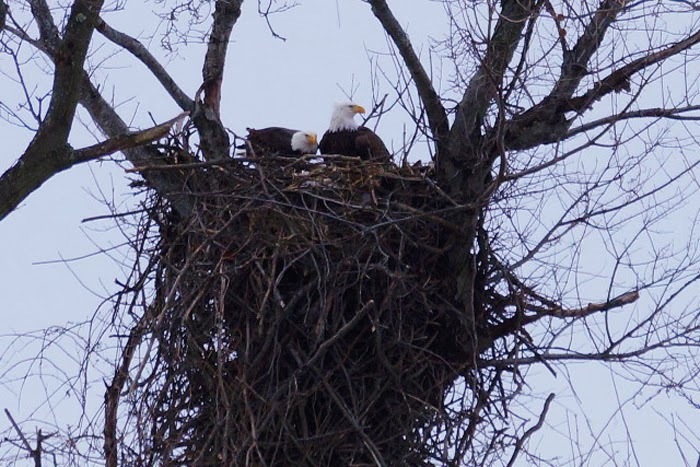 Just a reminder, those big old Bald Eagles should be well settled on eggs in our area now and turning their attention to domestic duties. Bald Eagles continue to respond well to current protection measures and such top predators function as very important indicators of the health of our ecosystems [photo by Jeff White]. Now that temperatures are a little more bearable, don't miss the opportunity to enjoy the amazing duck spectacular along the barrier islands. The mournful whistling of Black Scoters and cacophony of Long-tailed Ducks is wonderful out there right now [photo by Mike Crewe]. A busy party of Long-tailed Ducks whips down the channel past Nummy's Island in soft, late afternoon light [photo by Mike Crewe]. We are right in peak migration time for Black-headed Gulls now, as small numbers head north along the eastern coast of North America. Look for dark, blood-red legs and bill - compare here with the pink legs and black bills of Bonaparte's Gulls (note the Forster's Terns in the background too). Here, one Black-headed Gull at center has a mostly white head while the head of a second bird behind it is already speckled with darker feathers [photo by Mike Crewe]. Every year I fall for it; the first signs of something different happening in the natural world and I start thinking of spring. And yet, it will be another six weeks or so before we can really say that spring has sprung and migration is well and truly under way. Despite this, there is certainly a feeling of change in the air; over the past few days, Northern Cardinals and Red-winged Blackbirds have been starting into song - not really full-bodied yet, but certainly tuning up. Why is this, given that it's still pretty chilly out there? Well, many signs of spring are initiated not by temperature, but by day length. Certain chemicals in the bodies of a wide range of animals and plants can convert to other forms in the presence of sunlight, and the levels of these chemicals can initiate changes in behavior when such chemicals reach a critical level in the body. In this way, the song of birds, the production of flowers in many plants, and the calls of many amphibians - notably frogs - begin in spring. And so, as we reach late February, such things begin at very precise times of the year - no matter what the weather conditions may be. Other things are clearly temperature related - such as the emergence of hibernating insects - clearly, if you are hidden away somewhere dark, it's going to be temperature not daylength that kick starts you in the spring. And thus our Honey Bees are starting to get active at home now and the first ladybirds and hibernating butterflies begin to appear on milder days. So there are two systems at play - temperature and daylength, evolved over millions of years to the point were it is all interlinked and all dependent on everything else. The chickadee's breeding season is initiated by daylength and is perfectly timed so that the chicks hatch just when caterpillar numbers are peaking on young oak leaves. Yet the caterpillar emergence is controlled by temperature. So what happens if daylength functions and temperature functions get out of sync. with each other? Well it looks like we are finding out these days as each spring brings more and more stories from around the globe of nature being disrupted. This is the most obvious and immediate effect of climate change and something to be more than a little concerned about. What can you do to help? Well, one thing that is proving helpful elsewhere but doesn't really seem to have caught on much here yet is the study of Phenology - the study of how seasonal changes affect species of animals and birds. Though I have made tentative efforts, there is still no real effort to help with this important work in New Jersey, but if you want to contribute, you might try helping through national schemes such as the USA National Phenology Network. So what signs are there locally that things are starting to stir? Well, over the past couple of days I've suddenly started noticing parties of Eastern Bluebirds on roadside power lines and perched along the edges of open fields and meadows; it seems they are already starting to head back north in search of spring. Ducks are on the move too and now is a good time to visit a single pond regularly and record the turn over of birds. Visit your local pond daily now and I bet you will see different ducks every time you stop by. The gathering of Redheads seems to have moved from Cox Hall Creek WMA in the last few days, but numbers are increasing on ponds a little further north, so perhaps the northward drift has began with ducks too. While late February and early March can deal us some dreary hands, regular visits to set locations can certainly provide interest now, as the element of surprise is always there! The Painted Bunting that has been wintering in the Cape May Point dunes suddenly showed up at the CMBO Northwood Center feeders today. Having been so faithful to its little spot up until now, it seems quite possible that this new bout of wanderlust may well be the precursor to it heading off elsewhere soon. In case you were wondering, small but distinctive nicks in the tip of the innermost tertial on the left wing confirmed this as the same bird that has been in the dunes since January 1st at least [photo by Mike Crewe]. A bird on the move indeed, but not all birds are moving right now just because of the weather. This Dovekie was found on one of the main ponds at TNC's South Cape May Meadows late this afternoon but it seems possible that this normally strictly pelagic bird would have turned up in such an odd place simply because it got disorientated by this morning's fog [photo by Mike Crewe]. Wrap up warm and head out to the barrier islands, where large numbers of ducks are responding to the icy conditions by heading into the marinas. So what is happening here? Well, initially these deeper water birds are responding to the freezing over of the main navigation channels and - especially - much of the Delaware Bay in recent weeks. They don't want to go right out into the main shipping channel as there will be little food for them out there, and what food there is will be harder to get to. The next best place for them will therefore be the marinas close to human habitation. These places often stay ice-free because of all the heat that leaks out from our houses, from engines on boats and cars and all that other human behavior going on. It might not be that much heat escaping, but it can certainly cause local temperature increases of two or three degrees, which can be enough to keep the ice away. Once the birds move into an ice-free area in large numbers, their very presence can be enough to keep small areas from freezing over. For the birds, this is a life or death situation; they don't really want to be this close to us, but they have little choice. Interestingly, however, once they get into these little pockets of water, they find plenty of small fish to eat and will often hang on long after the rest of the bay has thawed, and that is pretty much what is happening now. This weekend, we spent some time checking out back bay marinas around Wildwood and found a great selection of birds to enjoy - as did folks on our Longtails in Love program on Saturday. Here's a few pictures to show you what is out there. Stalwarts of the back bays every winter are Red-breasted Merganser (here a male with that crazy shock-top haircut) and Buffleheads (two females in the background). These birds are common winterers with us, but getting close can usually be difficult, especially with Buffleheads that are shot in large numbers [photo by Mike Crewe]. 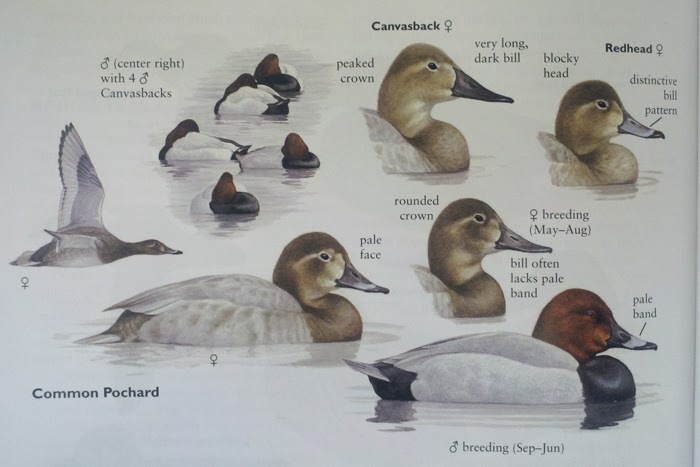 Having the ducks rubbing up shoulder to shoulder to gives ample opportunity to practice your identification skills. Compare the male Lesser Scaup on the left here with the male Greater Scaup on the right; look at head shape, bill size and shape, the amount of black on the tip of the bill and overall length and shape of the body [photo by Mike Crewe]. Unusual conditions provide unusual opportunities; Common Goldeneye are not common in Cape May County but they are regular winterers with us. The trouble is they usually spend all of their time way out on the Delaware Bay and even scope views can be hampered by heat shimmer. This year, these birds are gracing us with their presence in the marinas - here's a couple of females that were in Bree-zee-lee Marina on the north side of Cape May Harbor a couple of days ago [photo by Mike Crewe]. I think that this picture perhaps sums up what an unusual winter we are having for birds here. A Common Murre floats between two Red-necked Grebes, both species being birds that you would be hard-pressed to get in Cape May County during a 'typical' winter. Red-necked Grebes continue to appear in good numbers all around our coast and are well worth looking for right now; look for a slightly 'grubby-looking' grebe with smoky browns masking the usual clean-cut black and white pattern, and a yellowish base to the bill [photo by Mike Crewe]. Common Murres are abundant seabirds in the Northern Hemisphere, but favor more northerly, rocky coastlines for breeding and usually spend the winter well out to sea. Though getting such great views as this of a Common Murre in Cape May County is exciting, it's tempered by the fact that this bird is almost certainly not 100% fit, or it wouldn't be here. In this shot, a pinkish, bare spot can be seen near the base of the bill, while it has been noted regularly drooping its left wing. Both are consistent with the bird having hit something - perhaps flying into a cable at night, or even swimming into a cable while fishing underwater. The bird seems to be alert however, and there's a chance that it might recover and make its way back to the open sea [photo by Mike Crewe]. Yes, there are birds elsewhere too! Warren Cairo re-found the first-winter male Painted Bunting at Cape May Point on Friday afternoon. This bird seems to be spending the winter with us - despite the tough conditions - and, though elusive, it seems to be faithful to a section of beach dunes between the ends of Lehigh and Whilldin Avenues. Best bet seems to be to keep an eye on the tall clumps of Bitter Panic-grass that grow at the back of the dune near the sand fence. Try watching from the dune crossovers at either end of this stretch [photo by Mike Crewe]. CMBO is pleased to provide weekly summaries of the Cape's birding highlights. Coverage is limited to sightings in Cape May County. Readers should keep in mind that some reports may not be confirmed. The vast majority of information utilized in these reports comes from eBird data and "Keekeekerr" text alerts. Reports and photos that may be of use for weekly summaries can be emailed to compiler Tom Reed (coturnicops at gmail dot com). Weather: The first half of the period (8–11 Feb) was tranquil though cold, with daytime highs never surpassing the freezing mark under variable clouds and light NW winds. An onshore flow developed and strengthened through the PM hours 12 Feb, on the leading edge of a strong coastal storm. Precipitation associated with the system started as snow during the 12–13 Feb overnight hours, with accumulations generally 2–3" before changing over to rain, which fell through much of 13 Feb and included a rare bout of Feb. thunder and lightning during the early evening. Precipitation ended as snow with minimal accumulations through the overnight hours 13–14 Feb. Strong NE winds gusted to nearly 50mph through much of the storm. Winds shifted to the west during the early-AM 14 Feb, clearing away the clouds and allowing temps to climb into the 40s to close out the period. Birding Summary/Outlook: Observers submitted sightings of 145 species to eBird during the period 8–14 Feb. The best diversity day occurred on 9 Feb, when 119 species were reported. The 2014 cumulative county list currently stands at 182 species. Notable birds this week included Cackling Goose, King Eider, Red-necked Grebe, Northern Goshawk, Common Murre, Snowy Owl, Black-capped Chickadee, and Painted Bunting. Observers should keep an eye out for Red-necked Grebes and other waterbirds which may continue to arrive from points north in coming days. Location Abbreviations: CMP (Cape May Point), CMPSP (Cape May Pt. State Park), SCMM (South Cape May Meadows), SHPt (Stone Harbor Point), Sunset Lake (back bay in Wildwood Crest, bordered by New Jersey Ave and Park Blvd), Two Mile Beach (Unit of Cape May NWR, located at south end of Wildwood Crest). A Cackling Goose was spied amongst a flock of Canada Geese over Cape May City 14 Feb (WC). Two Tundra Swans, uncommon on Cape Island, remained at CMPSP and SCMM through 12 Feb (m. ob.). A male Eurasian Wigeon was seen along Ocean Drive and in Cape May Harbor 9–10 Feb (WT et al. ); two males were seen near the Bree-Zee-Lee Yacht Basin along Ocean Drive 14 Feb (SG). At least four Redheads held on at CMPSP through the period (m. ob. ), while the impressive wintering flock at Cox Hall Creek WMA peaked at 21 individuals on 12 Feb (MP). Nummy Island's two hen King Eiders continued through at least 10 Feb; recent sightings have come from the "toll bridge" at the south end of the causeway (m. ob.). Large numbers of seaducks have been present at Avalon's 8th St. Jetty recently. A total of approx. 1500 birds on 14 Feb was comprised primarily of Black Scoters, along with smaller numbers of Long-tailed Ducks, Surf Scoters, and 35-40 White-winged Scoters (TJ, SG). Notable was a northbound movement of 46 Horned Grebes past Sunset Beach 11 Feb (SG et al.). Red-necked Grebes continued to filter into the area this week. A sample of reports included a minimum of 3 in Cape May Harbor through much of the week (m. ob. 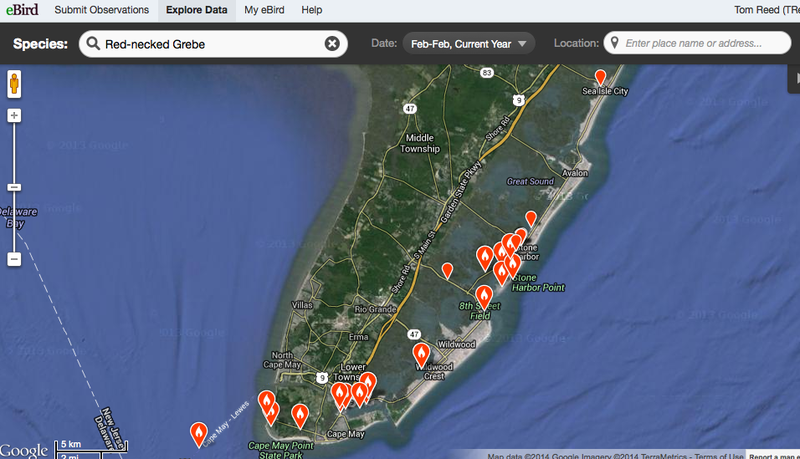 ), 2 at Corson's Inlet 8 Feb (TBx), 4 at 96th St., Stone Harbor 10 Feb (SG, DG, GD), 3 at Sunset Beach 11 Feb (SG et al. ), 1 at Sunset Lake 13 Feb (JCu), 4 at Sunset Beach 14 Feb (MP), 3 in a small pond at North Wildwood 14 Feb (JCr), and 1 at SCMM 14 Feb (CV). American Bitterns were noticed at Higbee Beach WMA 9 Feb (SH), Reed's Beach 12 Feb (TR), and SHPt 14 Feb (HT). February Tricolored Herons are always newsworthy; one survivor persisted along Sea Isle Blvd 14 Feb (TBx). 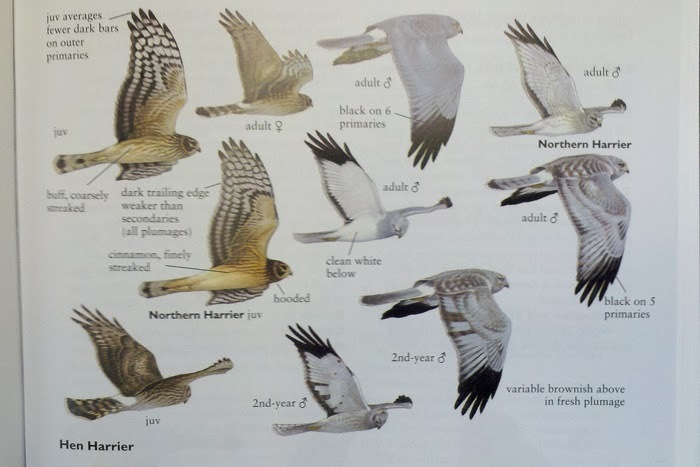 A Northern Goshawk continued to terrorize Cape Island through 11 Feb, when it was last seen near CMPSP (GD). A dark-morph Rough-legged Hawk was a curious find at Sunset Lake 10–12 Feb (SK, MH et al.). Most winter reports of this species come from the Delaware Bayshore and Tuckahoe River marshes. A Virginia Rail met an untimely demise when it collided with a moving vehicle at CMP 8 Feb (TBa). Another survived at CMPSP through 12 Feb (GD). Shorebirds continued to be in short supply, particularly along the Atlantic Coast, though Hereford Inlet's wintering flock of American Oystercatchers still contained at least 45 individuals this week (m. ob.). A flock of 41 Purple Sandpipers occupied the jetty at Two Beach Mile 11 Feb (MC). A Razorbill was swimming just offshore Poverty Beach 9 Feb (RC, m. ob.). Four Razorbills flew past Two Mile Beach during the nor'easter 13 Feb (TR), and three more flew out of the bay at Sunset Beach 14 Feb (MP). The wayward Common Murre at Sunset Lake stayed until at least 12 Feb (m. ob.). This species has only been seen from shore in Cape May County a handful of times. An adult Black-headed Gull was glimpsed again- this time along Delaware Bay near the ferry terminal 11 Feb (MP). An Iceland Gull put in a brief appearance at Two Mile Beach 13 Feb (TR), while a Lesser Black-backed Gull flew past CMP the same day (GD). Two long-staying Eurasian Collared-Doves remained at CMP, most often in the area of Harvard/Coral/Lincoln Avenues, though they have been more difficult to find during recent cold weather (m. ob.). SHPt continued to host at least one Snowy Owl through 14 Feb (m. ob.). Additional Snowy Owls were noted at the east end of Jefferson Ave in Wildwood Crest 8 Feb (TBa), along Beach Ave in Cape May City 9 Feb (m. ob. ), at the Cape May Coast Guard Base 11 Feb (CH), and on the north side of Cape May Harbor 14 Feb (CV). Surprisingly, there were no reports of Short-eared Owl this week. A Long-eared Owl was a bizarre midday sight 13 Feb as it flew along Route 47 in Green Creek (TR). [Black-headed Gull near the Cape May-Lewes Ferry Terminal, 11 Feb.
Songbird numbers are undoubtedly near annual lows at this time. An Eastern Phoebe lingered at CMP through 9 Feb (GD, DG, SG), while the same or another was seen again along Stevens St. in West Cape May 11 Feb (MO'B). A total of 34 Horned Larks notched at Sunset Beach 10 Feb, including a fly-by flock that contained 22 birds, was certainly weather-related (CV). Cape May County's fourth Black-capped Chickadee continued to delight observers at CMP through at least 12 Feb (m. ob.). A Lapland Longspur flew over Reed's Beach 12 Feb (TR); the Smith's Longspur hasn't been reported at SHPt since 31 Jan and has presumably moved on. Multiple Snow Buntings remained at SHPt through the period (m. ob. ), though numbers at that site continue to decrease. Two Orange-crowned Warblers were accounted for at CMPSP 10 Feb (MP). American Tree Sparrows were again reported at multiple locations (m. ob.). Remarkably, the Painted Bunting at CMP was rediscovered 14 Feb in the dunes at the end of Whilldin Ave (WC et al.). This sighting apparently establishes the second Feb. record of the species in Cape May County. Purple Finch was a bit more evident this week, with a max count of 12 at CMP on 9 Feb (DG et al.). Tom Bailey (TBa), Tom Baxter (TBx), Warren Cairo (WC), James Cremer (JCr), Mike Crewe, Richard Crossley (RC), Jacob Cuomo (JCu), Glen Davis (GD), Sam Galick (SG), Doug Gochfeld (DG), Chris Hajduk (CH), Marilyn Henry (MH), Scott Hinkle (SH), Tom Johnson (TJ), Sandra Keller (SK), Michael O'Brien (MO'B), Mike Pasquarello (MP), Tom Reed (TR), Wendy Tocci (WT), Harvey Tomlinson (HT), Christopher Vogel (CV). eBird. 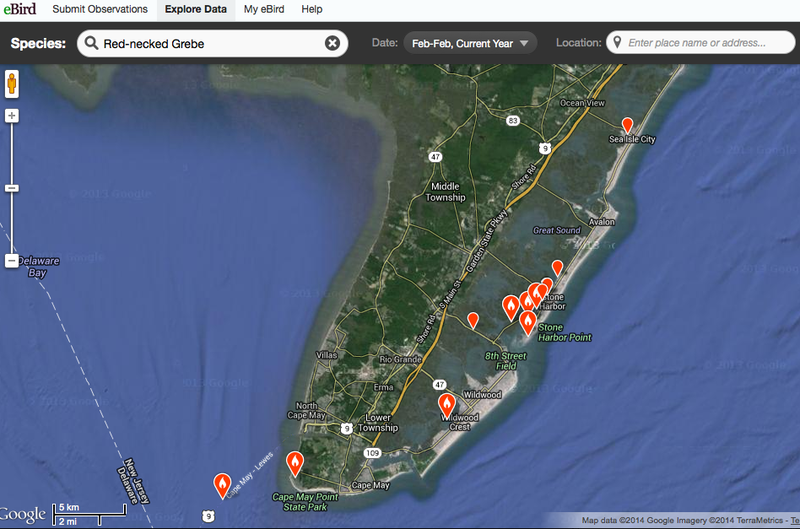 2012. eBird: An online database of bird distribution and abundance [web application]. eBird, Cornell Lab of Ornithology, Ithaca, New York. Available: http://www.ebird.org. If you really want to make a name for yourself in the world of birding, you need to be prepared to go the extra mile - try just that little bit harder, cram just a few more bird calls into your internal filing cabinet. Of course, one of the greatest things about birding is that you can satisfy yourself at what ever level works for you; a few yard birds from the back porch, participation in citizen science projects or an all consuming passion to see all the birds in the world. Whatever works for you. But for most people, the fun comes in pushing your own boundaries, testing yourself, turning your birding into a sport. That old 'hunter-gatherer' thing. To enable us to do this, we need information and there's certainly a lot of information out there. It seems to me that a new bird book comes out almost every day of the year, so you need to filter the information and decide what really is of use to you. In North America, one area in which there has been a real shortage is in information on extralimital birds. That is to say, birds that could turn up here as vagrants from other parts of the world. In the case of North America, that largely means Central American birds along the Rio Grande, Asian birds in Alaska and European birds in Newfoundland and the North-eastern states. Finally, help is at hand, and it's such a big leap in the information stakes that I just had to mention it here on the blog. 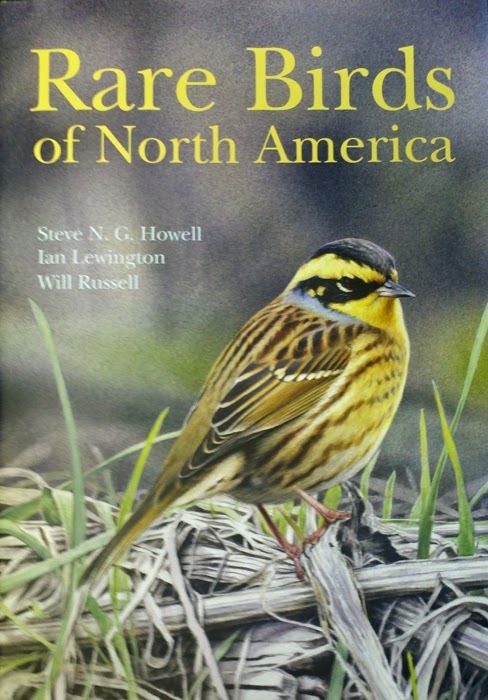 Help comes in the form of Princeton's Rare Birds of North America by Steve Howell, Ian Lewington and Will Russell. Not only does this book give you all the identification help that you need, but it compares the species with those North American species that are most similar to them and thus need to be eliminated during the identification process. Will Russell will be known to many for his involvement with the bird tour company Wings, while Steve Howell has already carved himself a niche as author of some fabulous and very desirable bird books, more recently including such titles as Molt in North American Birds for the Peterson Reference Guides series, and Petrels, Albatrosses & Storm-petrels of North America. Artist Ian Lewington produced the plates and will be less well known here than in his native UK, where his magnificent work has been used for many years - yet you may know him from some of the plates in the later volumes of Handbook of the Birds of the World. But this is not just an identification to a bunch of birds that you might never see (though you might if you know how to identify them! ), this book also has an excellent set of opening chapters on relevant topics which all birdwatchers would find useful and which justify purchase of the book by anyone interested in knowing more about birds than simply what they look like. Chapters such as Migration and Vagrancy in Birds, and Topography, Molt and Aging get excellent coverage here and should more than prepare you to find the next Smith's Longspur that turns up! Want a copy? Just call the Northwood Center and grab one of the first few that have just come in - we can always order more!!! The latest fine pedigree from the Princeton University Press stable, Rare Birds of North America deserves a place on every birdwatcher's bookcase - or in the car! Just two plates from Rare Birds of North America - Ian Lewington's outstanding artwork is reason enough alone to buy the book and these two plates should give you some ideas for things to look for around Cape May in the coming weeks! The acid test - do you take your birding seriously enough to want to own this book? Well, given the weather we have had recently, if you have been out and about and dressed like this over the past few weeks, then you need this book - names have been left out to protect the innocent! Valentine's Day is just around the corner- bundles of roses are for sale, chocolates take up a whole aisle in Walgreens, and those sweetheart candies with messages on them (my favorite, personally) go on sale for half-price after the 14th! While you think and wrack your mind about something special for your loved one, everything around you seemingly acquires a certain level of personified love. It may be as obvious as two Mute Swans crossing at the right moment in your scope forming a heart with their necks, or as odd as a simple sign pointing the way to the person who makes your heart beat a little faster. Still, if you find yourself not being able to spend time with your heart thumper, you can take a little solace in witnessing love forming by the sea. You can hear the musical love notes before you see them- jumping out of your car at a rock jetty or walking out of the dunes to the beach, the first thing you'll probably hear is a Long-tailed Duck's best version of singing. Almost incessantly in large groups, it's a comforting sound to resident birders that the long winter is progressing its way into spring and that you're not the only one thinking of warmer weather. Tom Johnson and I recently had the opportunity to immerse ourselves with a flock of loving seaducks at the Avalon Seawatch. The light was fantastic and the waves forgiving making way for an awesome intimate experience with these great birds. Female Long-tailed Duck- A very striking lady-bird with a seemingly powdered black and white face, all dolled up looking their best for potential mates. A couple of easy markers making this a female- the lack of any pink in the bill and the absence of a white carpal bar [photo by Sam Galick]. Paired up- Is it just me or has anyone else noticed the lady goes first when it comes to ducks? It's either the guys being polite or they're just chasing after the girls. I just haven't figured out which one it is yet...[phoyo by Sam Galick]. There are a number of waterbirds you'll surely run into this time of the year while looking for Long-tails- Black, Surf and White-winged Scoters, but the deep freeze a couple weeks ago left many other species of waterbirds moving south for open water. A large movement of Greater & Lesser Scaup, and Red-necked Grebes have moved into the county. The interesting thing about forced migration of waterfowl are their tendency to stick it out where ever they find themselves afterward. Moving south to avoid getting locked into a lake is a necessity, but the zugunruhe (migratory restlessness) to move back north isn't present. 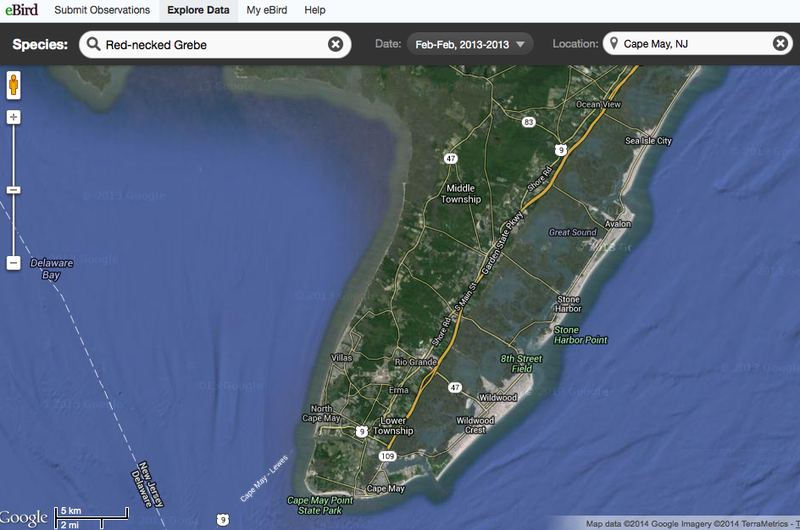 Find any odd corner of open water along the barrier islands and you'll see what I mean! Yes, it really is a magical time along the shore at the moment, and the very reason why we set our Longtails in Love program to take place close to Valentine's Day. We'll be heading out to the barrier islands on Saturday, February 15th why not join us and soak up the amazing atmosphere. You can check for details on our Activities Calendar or call 609-861-0700 to register beforehand. 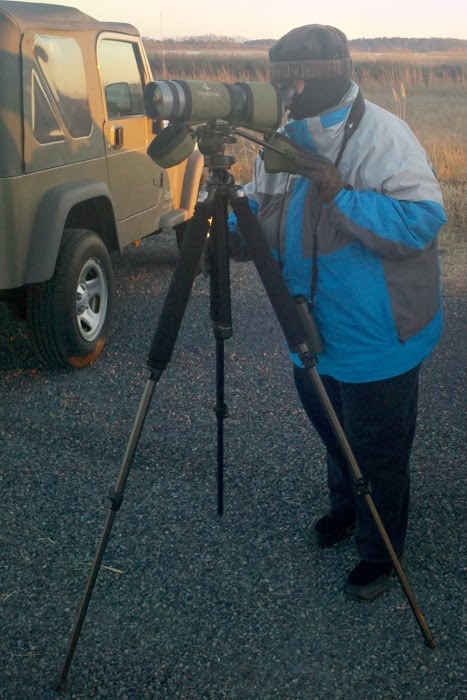 CMBO is pleased to provide weekly summaries of the Cape's birding highlights. Coverage is limited to sightings in Cape May County. Readers should keep in mind that some reports may not be confirmed. Information and photos that may be of use for weekly summaries can be emailed to compiler Tom Reed (coturnicops at gmail dot com). Weather: The period opened with cool and clear conditions under a light onshore flow 1 Feb. Winds shifted to the south and bumped temperatures to 55ºF by mid-afternoon 2 Feb, but the balmy conditions would be short lived. A large but fast-moving storm system moved through 3 Feb and produced over an inch of rain. North winds followed behind this storm and suppressed daytime temps to the low 30s under overcast skies 4 Feb. Another quick-hitting storm system dumped an additional inch of rain 5 Feb and was followed by another shot of colder air. Temperatures struggled to surpass the freezing mark 6–7 Feb, accompanied by clear skies and NW winds to close out the period. Birding Summary/Outlook: Observers submitted sightings of 155 species to eBird during the period 1–7 Feb. The 2014 cumulative county list currently stands at 180 species. The best diversity day occurred on 1 Feb, when 135 species were reported. Notable birds this week included King Eider, Red-necked Grebe, Northern Goshawk, Spotted Sandpiper, Common Murre, Snowy Owl, and Black-capped Chickadee. Observers should keep an eye out for Red-necked Grebes and other waterbirds which may continue to arrive from points north in coming days. Location Abbreviations: CMP (Cape May Point), CMPSP (Cape May Pt. State Park), SHPt (Stone Harbor Point). Two Tundra Swans remained at CMPSP and the South Cape May Meadows through 6 Feb (m. ob.). A male Eurasian Wigeon was seen at Lily Lake 1 Feb (m. ob.). A male Canvasback joined a few dozen Greater Scaup at Reed's Beach 4 Feb (TR). Several Redheads held on at CMPSP and Cox Hall Creek WMA through the week (m. ob.). Nummy Island's two hen King Eiders continued through 7 Feb; recent sightings have come from the "toll bridge" at the south end of the causeway (m. ob.). An influx of Red-necked Grebes occurred this week. Delaware Bay sightings included one seen during a ferry crossing 1 Feb (TS, AK) followed by a total of 7, including a flock of 5 apparent migrants, at CMP 2 Feb (GD). Atlantic Coast sightings included 2 at Nummy Island on 2 Feb (m. ob. ), and at least five in the back bays of Stone Harbor throughout the week (JA, TJ, SG et al.). Additional grebes were found on 5 Feb at 44th St., Sea Isle City (TJ, SG) and along North Wildwood Blvd (TR), and on 7 Feb at Sunset Lake (MP). Two or three American Bitterns remained at SHPt this week (m. ob.). A Northern Goshawk made appearances at various locations on Cape Island 1 Feb (m. ob.). Light-morph Rough-legged Hawks were seen 1 Feb at Tuckahoe WMA (MC) and at Reed's Beach (TR). Shorebirds have been in short supply, but Hereford Inlet's wintering flock of American Oystercatchers still contained at least 40 individuals this week (m. ob.). Avalon's 8th Street Jetty hosted 45 Purple Sandpipers 2 Feb (TJ, SG), and 3 Semipalmated Plovers were seen along the northern Avalon beachfront 1 Feb (KA). A Spotted Sandpiper was a surprising find along the Delaware Bay at High's Beach 6 Feb (WK). Even more surprising was a Common Murre at Sunset Lake, Wildwood Crest 6–7 Feb (TB, m. ob.). This species has only been seen from shore in Cape May Co. a handful of times. Two long-staying Eurasian Collared-Doves remained at CMP, most often in the area of Harvard/Coral/Lincoln Avenues (m. ob.). SHPt continued to host one or two Snowy Owls through 2 Feb (m. ob.). Additional Snowy Owls were noted atop Congress Hall in Cape May City 1 Feb (MG, m. ob. ), at 54th St., Avalon on 2 Feb (TJ, SG, m. ob. ), and at the Cape May Coast Guard Base 7 Feb (CH). Short-eared Owls continued to show at Jake's Landing on nicer evenings (m. ob. ), while singles were observed between Nummy Island and SHPt 1–4 Feb (MC, WK). Two Red-headed Woodpeckers were seen at The Nature Conservancy's Lizard Tail Swamp Preserve 6 Feb (SG). A remarkably hardy Eastern Phoebe lingered at the Beanery/Rea Farm and along Stevens Street in West Cape May 1–2 Feb (MO'B, HB). Cape May County's fourth Black-capped Chickadee remained at CMP through at least 5 Feb (MP, GD). Multiple Lapland Longspurs continued at SHPt through 2 Feb (m. ob.). The Smith's Longspur hasn't been reported since 31 Jan. A flock of 33 Snow Buntings bounced around SHPt 5 Feb (TR). An Orange-crowned Warbler appeared near the observation deck at SHPt 2 Feb (MD); another was seen at CMPSP the same day (WK). American Tree Sparrows were reported at multiple locations (v. ob.). A few Nelson's Sparrows and Saltmarsh Sparrows were found at SHPt 1 Feb (m. ob.). Winter finches remained nonexistent-- this week's only Purple Finch report was of a single bird at CMPSP 2 Feb (WK). Jesse Amesbury (JA), Kate Atkins (KA), Tom Baxter (TB), Henry Burton (HB), Mike Crewe (MC), Glen Davis (GD), Martin Dellwo (MD), Sam Galick (SG), Mark Garland (MG), Chris Hajduk (CH), Tom Johnson (TJ), Will Kerling (WK), Alan Kneidel (AK), Michael O'Brien (MO'B), Mike Pasquarello (MP), Tom Reed (TR), Taj Schottland (TS). As the cold weather conditions continue to hang around, each day seems to bring more and more to enjoy in the sheltered corners of the barrier islands. Though much of the pack ice has disappeared from the Delaware Bay over the past few days, it was around long enough to shift a lot of waterbirds out of the river estuary and send them in search of open, sheltered bodies of water. With just a couple of extra degrees of warmth provided by surrounding houses, open water remained in many of the quiet, backwater marinas along the western side of the barrier islands and bird soon found these locations. And though the ice has freed up now, they will probably hang around for a few days yet until they move back out again, providing ample opportunity for us to enjoy them. Pretty much anywhere along the barrier islands is worth checking right now; simply cruise around the back streets until you find a gap in the houses that allows access to the water and check what is out there. Greater and Lesser Scaups, Buffleheads and Hooded and Red-breasted Mergansers are likely to make up the bulk of what you see, but there's plenty of Goldeneye appearing now, as well as the occasional Redhead, Canvasback and Long-tailed Duck too. While scanning these duck flocks, keep an eye out for something different; Common Loons are pretty easy to spot simply by their size, but Horned Grebes can easily be missed in a tight bunch of other birds. Horned Grebes are common in the back bays during the winter, but tend to concentrate in one or two favored locations out in the larger sounds so can be overlooked. Being typical grebes, they are relatively long-billed and short-tailed, with dumpy back ends and long necks giving them a heavy-fronted look. But increasingly at present, there is an extra bonus bird out there to look for - Red-necked Grebes are moving down the coast and higher than usual numbers are being reported from the region right now. Unless you work really hard, it's not too difficult to miss Red-necked Grebe completely during a typical year in Cape May. One or two show up pretty much every year, but some are brief fly-bys at the Avalon Seawatch, while others seem to drift in and out of the inlets all too quickly and can be here today and gone the next. Currently, Red-necked Grebes can be found in the channels around Nummy's Island - check from either end of the island around the bridges - and in the marinas off the west side of Avalon and Stone Harbor, while other coastal South Jersey birds have been reported from Barnegat Light, Tuckerton and Heislerville. Pied-billed Grebe, Cape May Point, December 2009. This is our commonest grebe by far, being more or less resident in the area, but disappearing southward during cold winters. A few may still be found around the back bays but they largely prefer freshwater. Typical grebe features include a tailless, round-bodied look, long neck and large, angular head. 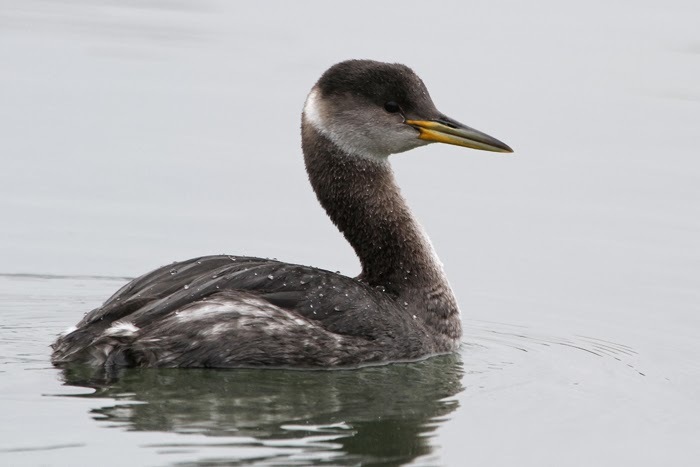 Pied-billed differs from all other grebes in our area in having a deep-based, heavy-looking bill. The plumage is overall brown with a paler back end [photo by Mike Crewe]. Horned Grebes, Nummy's Island, March 2013. Our second commonest grebe - and often the commonest in winter - is Horned Grebe. This species is always strikingly black and white with no brown tones at all. Notice the clean white cheek patches and dark hind neck. These two birds show just how much a species can vary in overall appearance, with the right hand bird being relaxed, with the feather puffed up and showing off the white flanks. The left hand bird has been actively diving and is still alert, with the feathers sleaked down against the body. 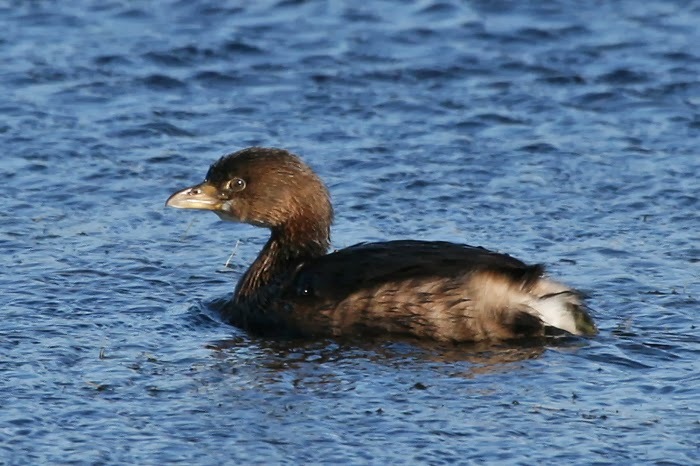 Note the bill is narrower and more dagger like than Pied-billed Grebe's bill [photo by Mike Crewe]. Red-necked Grebes, Stone Harbor, February 2014. Typical grebes with rounded rear ends, angular heads with flat crowns and dagger-like bills - all non-ducklike features. In this typical distant shot you can get the overall feel of the species - note the pale cheeks like Horned Grebe, but note the brown tones in the plumage, and especially the smoky neck on the left hand bird. Note here too, how different the bill looks in length depending on posture [photo by Mike Crewe]. Good fieldcraft can put you in line for a good shot if you let the bird get used to you and you spend a little time working out its feeding patterns. Close-up, Red-necked Grebes often have a distinctly reddish tone to the brown neck and smoky smudges on the ear coverts. This is a medium-sized grebe, noticeably longer necked, longer billed and overall larger than the two species above and has a yellow base to the bill that can be noticeable from quite a distance [photo by Mike Crewe]. A classic Red-necked Grebe profile at Stone Harbor today. Note the bill is held slightly pointing downward. Two rare species on the East Coast - Eared and Western Grebes, both have a tendency to have an uptilted look to the bill [photo by Mike Crewe]. You only need one eye to take photos, so it always pays to keep the other one looking around for anything else of interest. While I was photographing the Red-necked Grebes, tucked down in the marina woodwork, this Black-crowned Night Heron flew in and landed close by. Smoky brown, second-winter birds like this one are often not illustrated in field guides so can be confusing. They lack the pale spots of first-winter birds but don't yet have the white underparts or dove-gray wing coverts and black backs of adults [photo by Mike Crewe].